We were doing some location scouting on Sunday. Part of an upcoming Intrepid story takes place in a cave, and since the caves are supposed to be on a different planet from the last lot of caves we filmed in, they needed to look different. For the episode called Transitions and Lamentations, the cave was really a some rocks which had collapsed together leaving large gaps. It looked the part though and started to flood as the day wore on. We got the shots though. 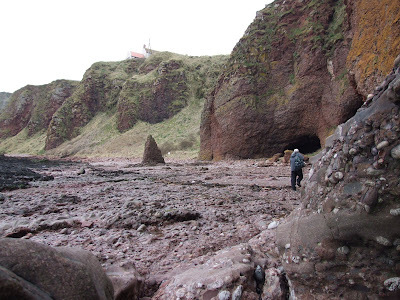 So just in case that wasn't traumatic enough, the caves we went to have a look at this time were Arbroath. 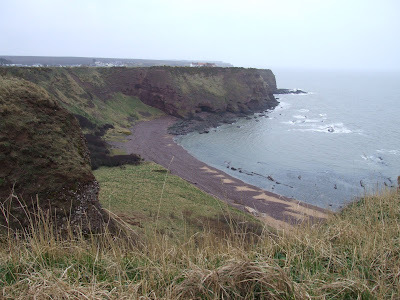 Just outside Arbroath in fact. Right next to the sea. By that time it had started to pour with rain as well. 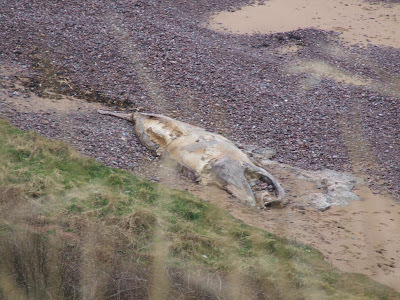 A much better overview could be found via the clifftop path, which was vantage point enough to sea some more impressive caves and also a beached and entirely dead whale on the beach below. I managed to get a few photos on maximum zoom, but we weren't able to get closer. The path was purely around the edge of the cliff and the only reasonable route to it involved navigating what looked like the output of a sewer, so we gave up the idea. As it turns out, the whale had already been reported. As far as I can tell, it was a Minke whale, which is the only common one around Scotland. Nice though the caves were, we're not convinced they'd be easy to film with. Tides aside, they're difficult to get to and that was just us lot without any gear. usyjbThrow in, along with gear, that you'll have people either in or with uniforms that could easily get very messed up. I doubt that would make Nick & Co. very happy. 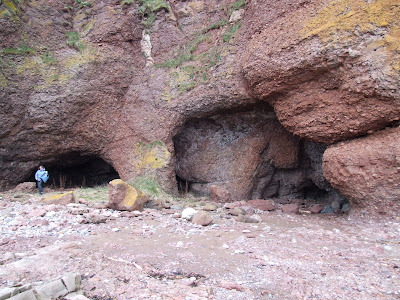 If you've got caves you've used before, is there anything THAT distinctive about them? Could you color correct them to make it look diifferent? Somehow, the title of this, I can't see it being used in an ad campaign unless it's sent to very weird people. You know, ones like me. Can we have some photos of WALES please?